Have I mentioned that I love having a little girl? I love the pink. I love the toys! After three boys it's so much fun to buy presents that aren't legos or Star Wars themed! Ellie got the same type of cradle that we made for Water4Christmas. 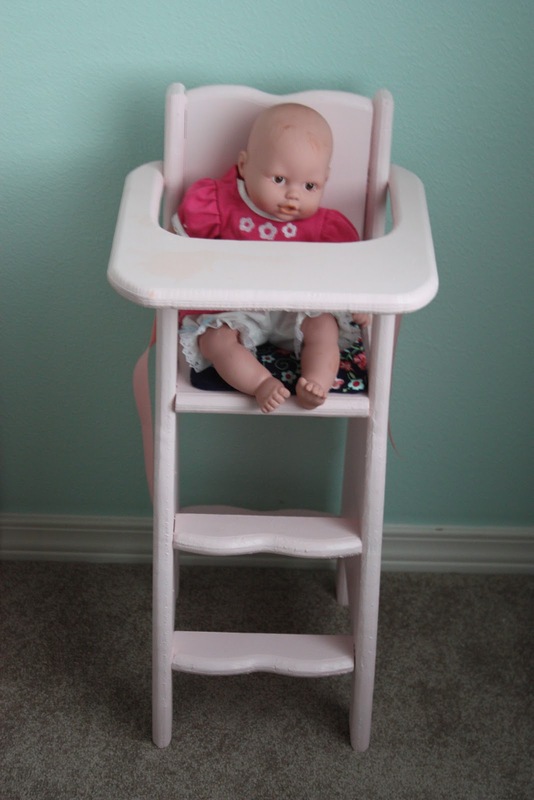 The doll cradle and highchair patterns are from this Etsy seller. It was about $12 for both patterns. 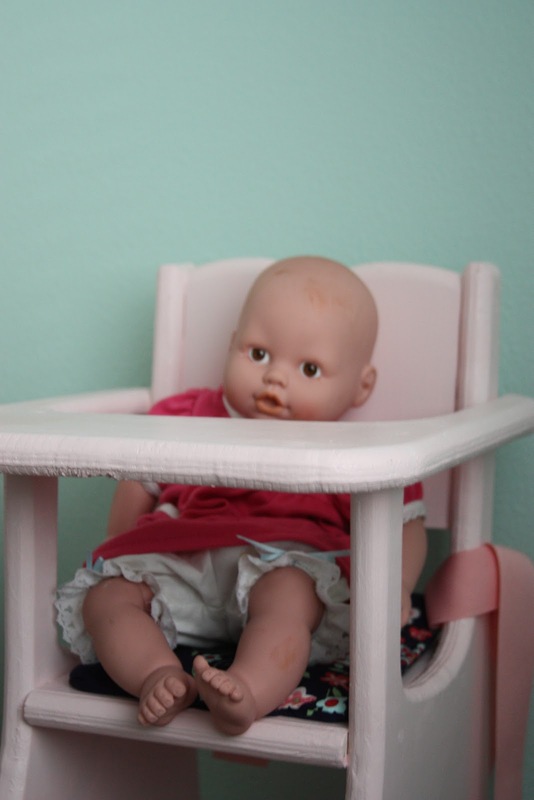 I've seen some free high chair and doll bed patterns on Ana White's site. 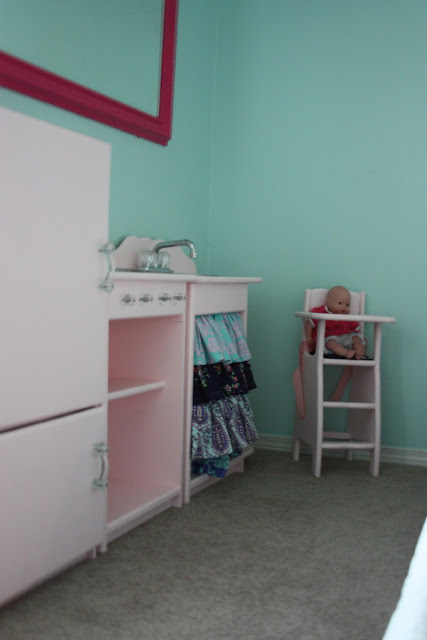 But I wanted something that was more antique looking and would look cute with the pink play kitchen. I painted them both with my favorite pink Behr's Powdered blush. 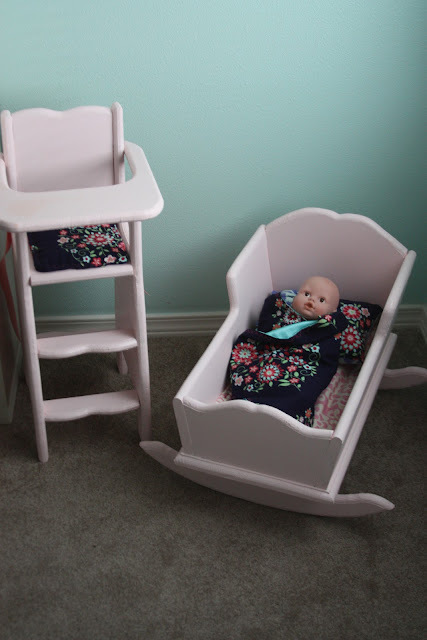 They each took about one board of 1x12 so I think the total cost for the cradle, highchair and patterns was about $40. Love how the highchair turned out! The doll is 15 inches so I think it's designed for a slightly bigger doll. But the doll doesn't seem to care and eats her fake food just fine from this chair. I made the little pad from some Amy Butler Love fabric. I think it looks perfect with the little kitchen and she LOVES the chair and the cradle. Usually there are multiple babies heaped in both. Christmas eve. I finished this in the nick of time! I even had to put wrapping paper down on the carpet since the paint wasn't quite dry. The adorable doll clothes were made by my Grandma. The same kind that she used to make me when I was little. LOVE them. Ellie and I will have to play doll dress up and show off her Great Grandma's cute outfits she made with no pattern. My husband was even impressed especially since every outfit has a matching hat and even little bloomers. My Grandma is totally where I get my DIY gene. I remember making doll house furniture with her and sewing little barbie outfits, even painting furniture! Such great memories.